Wood swells and shrinks according to the relative humidity of the air around it. Seasonal, and even daily, changes in relative humidity effects wood, felt, metal, leather, glue, and piano finishes. The piano soundboard is a component greatly affected by relative humidity because it swells with high relative humidity increasing tension of the strings and shrinks with lower relative humidity relaxing the tension of the strings lowering the pitch of a piano. Pianos are harder to tune if they experience this tension on the soundboard. This tension is also capable of cracking the soundboard. 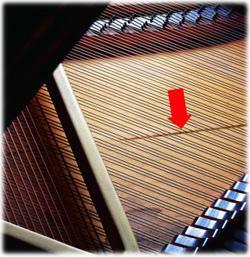 Call ( 2 0 8 ) 9 3 2 - 3 5 4 1 to see if a Piano Life Saver System is right for you.